The Volkswagen GTI is a fun little economy car that you’ll actually like owning even after you turn 30. What do you need to know before you buy a GTI? Don’t worry, we’ll tell you everything right here in the Ultimate Buyer’s Guide. Not all hot hatch fans like the GTI, but everyone should respect it. It may not have been the first hot hatch in existence, but it was the car that convinced the world how awesome sporty three and five door economy cars actually are. People loved that original 1976 GTI, and ever since, the market has been yearning for quick, fun, practical compact cars. The MK1 GTI deserves our thanks for getting the ball rolling. The unique thing about the GTI compared to its competitors is that it’s actually a really sophisticated car. It doesn’t come in crazy colors like “Tangerine Scream,” the interior isn’t overdone with flash, and there’s actually some fancy tech under that hood. It’s a quick compact car that doesn’t qualify for the “boy racer” descriptor. It’s a car you can keep even after you left your frat bro times behind for a domestic life in the ‘burbs. The Volkswagen GTI inspires confidence with predictable steering and decent power. The MQB platform on which it’s built is one of the best out there and the 2.0-liter engine has been boosted to 210 horsepower and 258 lb-ft of torque. Veyron numbers they aren’t, but it’s not a surprise that the same company that makes the Bugatti is the same one that makes the GTI. Every detail is designed to make for a better driving experience, including the XDS electronic ‘differential’ that helps you maintain traction and reduce understeer under heavy loads by applying pressure to one wheel or another. The GTI is also one of the few vehicles where the automatic transmission is almost as good as the manual, offering VW’s famous DSG dual clutch transmission. The 2015 model GTI was special because it was all new, offering more interior space than the sixth generation car thanks to its 2.1 inch longer and 0.5 inch wider body. That EA888 TSI engine added 10 horsepower and 51 lb-ft of torque over the previous model, and fuel economy improved by 3 MPG on the highway with the manual. Improvement is good. This year’s 2016 model isn’t quite as special, as it’s basically just a 2015 with a new MIB II infotainment system. 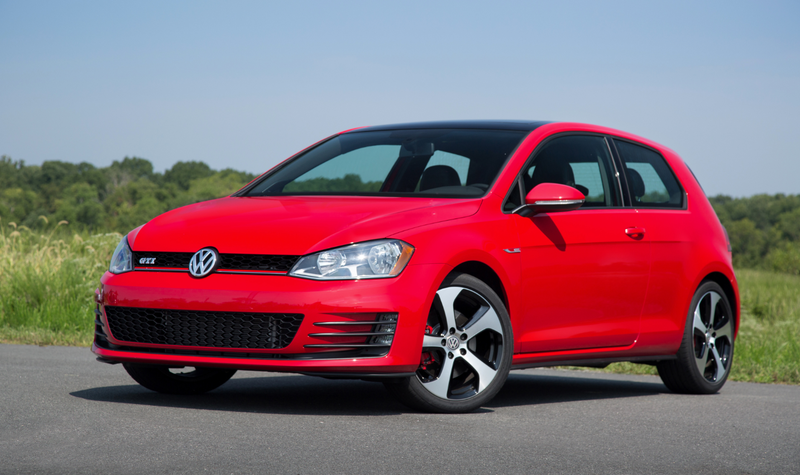 The Volkswagen GTI cranks out 210 horsepower at 4,500 rpm and 258 lb-ft of torque at a low 1,500 rpm. That’s a lot of low end grunt, especially for a car this small. The formula is classic GTI: Small, modestly powerful engine up front and, of course, a manual transmission option. But, like the last two generations, there’s a DSG dual clutch transmission, which is actually pretty decent and will shift faster than any driver could by hand. It also gets launch control, which is awesome. If you want an extra ten horses, the performance pack will boost output to 220 horses. And we all know: more horses equals more better. Fuel economy is great. At 28 MPG combined, the GTI bests its Focus ST foe by a not-insignificant 2 MPG. And fuel economy is one of the real selling points for the GTI. It’s a car that offers tons of practicality, great handling, good power, and really good fuel economy. It’s a car that makes very few compromises. The GTI comes in three basic trim levels: S, SE , and Autobahn. S: Base model. Starts at $24,995 for 2-door, $25,595 for four door. Notable standard features: 2.0-liter turbo I4, six-speed manual transmission, 18-inch aluminum wheels, Bluetooth, rearview camera, MIB II infotainment system, 6.5-inch display, satellite radio, leather-wrapped steering wheel, cloth sport seats, partial power seats for four-door, LED foglights, and driving mode selection feature. Notable options: automatic transmission ($1,100), Performance Package: larger brakes, electronic limited slip differential, 10 additional horsepower ($1,495); Lighting package: Bi-Xenon headlights with LED daytime running lights and adaptive headlights ($995). SE: Starts at $28,025 for the 2-door, $28,625 for the 4-door: Notable standard features over the S: power sunroof, keyless entry with push button start, automatic headlights, rain-sensing wipers, premium audio system, leather seats. 4-door adds partial power seats. Same options as S trim plus: DCC adaptive damping system ($800+performance package); Driver Assist Package: Adaptive cruise control, forward collision warning with emergency braking, lane departure warning, blind spot monitor with rear traffic alert, park distance control, and park assist ($1,495). Autobahn: Starts at $30,135 for the 4-door. Not available on 2-door. Notable options over SE: Navigation, 12-way power driver seat, automatic climate control. Same options as SE.